I did not come up with the idea of carving a tiny face in an orange bell pepper, but I am completely enamored with the result. (I did, however, make up the filling recipe and it might be a new favorite. When you are looking for bell peppers to stuff, try and find ones that have 4 quarters instead of 3 thirds, the 4 little “feet” makes them stand up much better in the pan. I’ve also heard that the 4-part peppers have fewer seeds, so, there’s that. You can really stuff a jack-o-lantern bell pepper with any filling you’d like, my version is ground turkey, spinach, and rice topped with a little Parmesan. Cook rice according to package instructions, while it is cooking make the rest of the filling. Heat olive oil in a large skillet and add onion and garlic. Saute until the onion is soft, 3-5 minutes. Add turkey and spices–the red pepper flakes absolutely made this dish, there wasn’t enough to be spicy, but it definitely added some flavor to the (in my opinion) somewhat bland ground turkey. While that is cooking chop up the tomatoes and spinach, throw in pan with salsa. Let this simmer for a while, at least until your rice is done. While the filling is cooking you want to prepare your peppers. 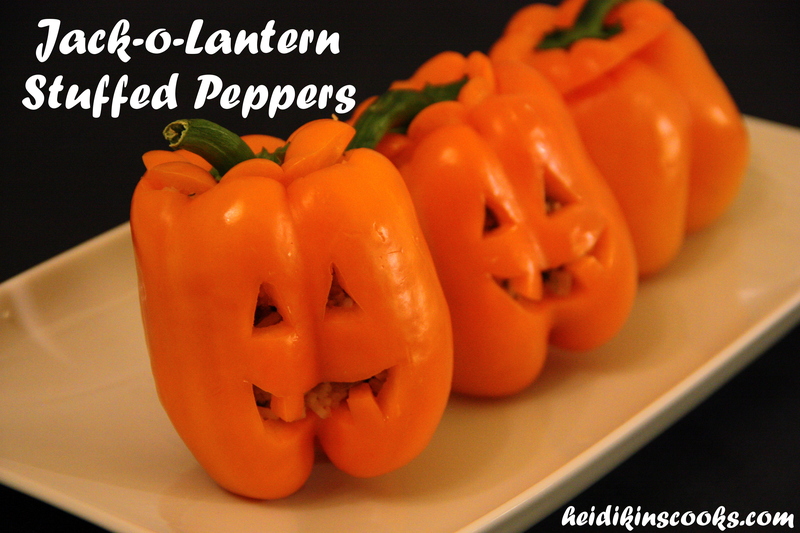 First use a small, sharp paring knife to cut out a tiny Jack-o-Lantern face in the pepper. I went really simple with triangle eyes and a big grin. As long as your knife is sharp you shouldn’t have too much trouble with this part. Now, there are two schools of thought on stuffed peppers: some prefer to blanch them in boiling water before filling them; others stuff them without any pre-cooking. I tried both ways here and found that it didn’t make too much of a difference, although to be completely honest the blanched peppers were a bit softer. They also lost a bit of their color (turned more yellow than orange). If you want to pre-cook your peppers, you should carve the face prior to this step as carving a face in a softened pepper will probably generate some swears. Bring a pot of water to a boil and drop the de-seeded peppers in for 2-3 minutes, remove with tongs or a slotted spoon and let drain; I put them on my wire rack over the sink. Place your peppers standing up in an 8×8 glass pan; this is where the 4-quarter pepper far exceeds its 3-part sibling. When your rice is done, add 1 1/2 cups to the turkey mixture, remove from heat and stir in the Parmesan cheese. Spoon the filling into each pepper, I pack in as much filling as I can. You may have a little extra filling, but that is far better than not having quite enough and it’s delicious as a lunch on it’s own. Top with a bit of Parmesan and bake for 40-55 minutes. The pre-blanched peppers could easily bake for 35-40 minutes, while the raw ones would do better with a longer baking time.